Hippo Flambé: Homemade Whey, The Easy Way!! Homemade whey is an optional but highly reccomnded ingredient in Lacto Fermented Green Tomato Pickles and other lacto fermented foods. When you use whey in fermentation you can lower the amount of salt in the recipe with more consistent results. Whey contains active lactobacilli, the active lactic acid and lactic acid producing bacteria we rely on to preserve and ferment vegetables when pickling. When making lacto fermented pickles without homemade whey the amount of salt has to be increased, the salt prevents the production of bacteria which would may the vegetables to go bad before they had a chance to ferment. If you look on the web there are step by step instructions for making homemade whey using raw milk. This method requires you allow the milk to sit out at room temperature until it sours or curdles. Once it has curdled you can strain it and the liquid that is separated out is homemade whey. However there is a far simpler method for making homemade whey, one that can be used even if you live in a state where you cannot obtain raw milk. Many cooks have already made whey before, and then just threw the whey out as an unwanted by product. 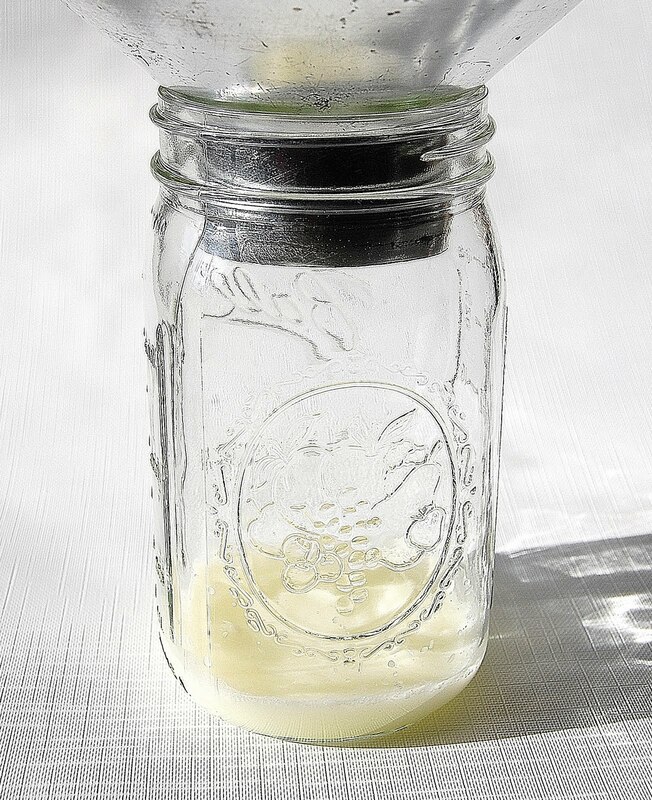 To make homemade whey take plain whole milk yogurt that contains active yogurt cultures and strain it. The liquid that strains out is the whey and you are left with thick Greek style yogurt or yogurt cheese in the strainer. In the past I have used a basket style coffee filter in a small strainer when straining yogurt, however I was out of filters so I borrowed a bee keepers honey filter from my neighbors. You know you live amongst your tribe when you can ask to borrow a filter to make whey and instead of your sanity being questioned for wishing to make whey you are offered an alternative. 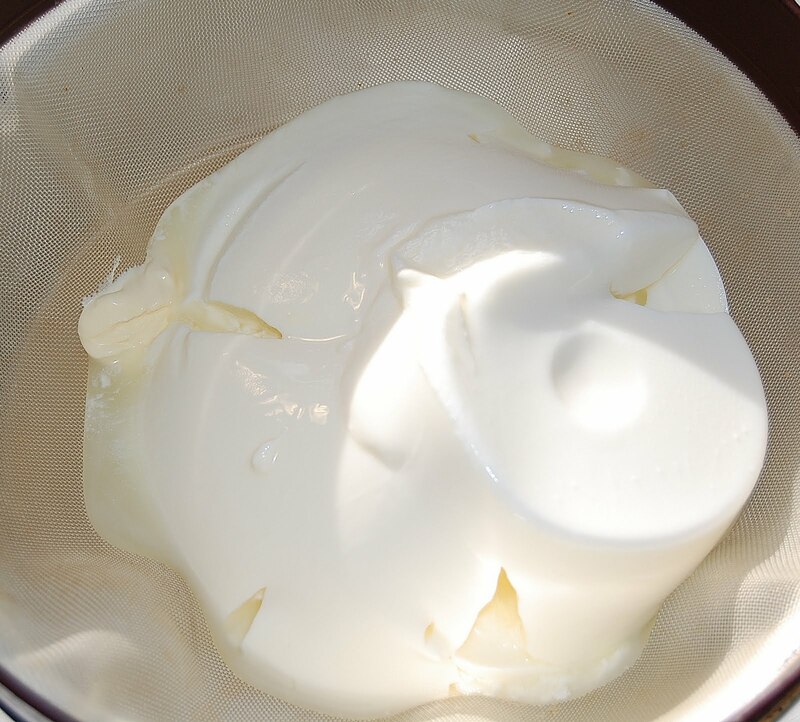 When making homemade whey and greek yogurt it is important to use whole milk yogurt because low fat versions often have stabilizers and thickeners in them, to make up for the missing fat, that could prevent the proper separation. In addition full fat yogurt is tastier and more satisfying, so in the end you will eat less. Somehow this feels less like making whey and more like harvesting it, but no matter how you describe the process it really is simple. That's pretty interesting because I've never heard of anybody actually making their own whey protein but it does make sense. I'm curious to try this out because whey is the number one protein and it contains countless vitamins, minerals, enzymes, amino acids and the number one antioxidant in the world - Glutathione. I do take it just about every day before workout and it has definitely helped me reduce my body fat and a great way I take it is in a shake. I recently wrote an article over here on whey protein shakes you should check out for some recipes. Maybe you can use it with your own whey.